Can online courses help bridge religious differences? Time will tell as a group of Harvard Divinity School and Wellesley College professors team up to teach a series of free courses on the world’s religions. Last week, I joined more than 20,000 people logging into the first course on religious literacy, taught by religion scholar Diane Moore at Harvard Divinity School. For me, it was a bit of a refresher because I interviewed Dr. Moore a while ago for Faith Ed. and read her book, Overcoming Religious Illiteracy. What I enjoyed most was reading the answers of other students on the discussion board and getting a sense of the diverse range of religions, countries, and regions represented among the students. Dr. Moore prompted us to think deeply about how religion plays a role in life in many ways, whether it’s through a piece of art, clothing, or rules for divorce. I highly recommend checking out this course and those that follow. Teachers may find exercises they can use with their students, at least at the high school level. For example, we watched sections of a Frontline documentary on Muslims in Malaysia and Turkey than were asked to talk about the differences in views and Islam among Muslims within those countries and between them. It was a great lesson about the diversity within religions. Last Tuesday, I attended a public presentation by Dr. Moore and the instructors of the subsequent religion-specific courses in the series, which continues into the summer. Presenters gave us a taste of their approach toward the religion they will teach, whether it was Christianity, Judaism, Hinduism, Buddhism or Islam. Dr. Moore talked about the project’s overall goals, including introducing people to rich traditions; give people the language and tools to understand religions which may minimize conflicts; and provide opportunity for people around the world to interact in a productive way. Ali Asani, the Harvard Divinity professor teaching the course on Islam, predicted that he may face the biggest challenge when he begins teaching about Islam on the Internet, which is open to all. He believed the course might draw attacks from Islamophobes as well as from Muslims with varying views. He gave a tiny glimpse at what he will teach, including examining the Koran as more than just a book. He showed us a clip of a concert of a singing group performing passages of the Koran. Kudos to the Religious Literacy Project for this venture, which will offer a free resource not just for teachers but for students of all ages, including myself. 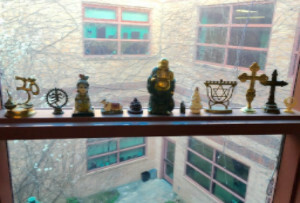 Many thanks to Sherry McIntyre, a teacher at Johansen High in Modesto, for providing this updated photo of her window sill. You may recognize the scene, but something has changed. She has added three more items, which were gifts from students. Check out the three items next to the menorah. Can you identify them? New Faith Ed. related article: Check out “Can Education Defeat Hate?,” my piece about the effect of world religion courses on students of varying ages in The Islamic Monthly. Connecting with teachers: I had a great exchange recently with Montgomery County, Md., teacher Christopher Murray and his high school world religions course by Skype. Chris has become a huge fan of Faith Ed. 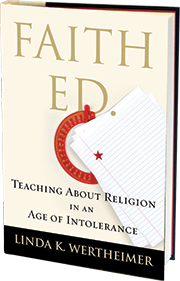 and how it can help teachers navigate teaching about religion, be bold in their teaching, yet avoid controversy. Upcoming Events in March, April: This month, I’ll be visiting a book club in my area and on another occasion, will give a private talk as part of a fund-raiser for a private Jewish day school. In April, I will be giving a few public talks – some local and on in Dallas. April 7: Talk at Hadassah Northeast, 1320 Centre St, Newton, Mass. 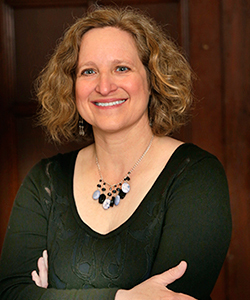 April 19: Featured speaker as part of panel discussion on teaching about religion, Jewish Community Center of Dallas, 7900 Northaven Road, Dallas, Texas. Other panelists include SMU religion scholar Mark Chancey and a rabbi. More info. to come. I’m not a political writer. I’m a writer about religion and education. But in today’s times, it’s hard to separate out the national political scene from my desire to see us respect each other, regardless of race, gender, or religion. Tagged Diane Moore, Faith Ed, Hadassah Northeast, Jewish Community Center of Dallas, Mike Waggoner, Nicholas Piediscalzi, Omid Safi, Religion & Education journal, The Islamic Monthly. Bookmark the permalink.